Law office management is one hell of a tightrope to walk. On one hand, you’ve got the usual duties of managing a team and dealing with clients. On the other, you have the added pressure of a single mistake changing “business as usual” into a $50 million malpractice lawsuit. Now, I won’t claim to have expertise in any legal fields, but what I can do is trawl through hours of research to bring you the best law office management tips on offer. Read on to find out how you can improve your law practice in terms of efficiency, security, and productivity. Although it might seem a little mundane, it’s important to make sure that your office is clean and tidy. For one thing, it presents a good image to your clients and helps to make sure that their first impression as good as possible. You need to lay out your office to reflect how seriously you take your clients, otherwise they will assume that any legal proceedings will be as disorganized as your desk. It also presents a productive working environment for your employees, since everything will be tidied away and easy to find. Many also believe that a tidy workplace encourages people to stay focused – there’s a psychological benefit as well as the practical one. Try out our free office cleaning checklist below to make sure that everything is taken care of. By running this every week or so you’ll also be able to track the cleaning process and be certain that the office is consistently clean and tidy. From client and court documents to internal processes and bookkeeping, it’s vital to have some kind of system in place for managing your paperwork. A good system will be secure, up-to-date, easy to navigate, and highly accessible. Your employees need to be able to access everything related to their work no matter where or when they need it. As such, using some sort of cloud storage can be highly tempting. Unfortunately, due to their terms of service, previous track record, and their status as large targets for hackers, it’s not widely agreed whether law office management should be using Dropbox or Google Drive. Instead, check out the competition and consider using a service like Sync or SpiderOak. These services take a dogged approach to security, making them a more reliable choice for lawyers and those generally involved in legal practices. Also, if you ever need to check the accuracy of completed documents or you want to make sure that your employees have all the necessary paperwork before a court appearance, it’s best to create a process for doing so. For example, we have a pre-publish checklist to run for every blog post that gets released to make sure that our work is at a consistently high standard. Processes remove the element of human error from your regular practices, and when the alternative is turning up with vital documents missing, it pays to be consistent. Whether they’re dealing with a client, filling out paperwork or preparing for a meeting, it’s important to make sure that your employees are following office policy. Having a consistent approach to everything from the way you dress to the tone you use in consultations is vital to presenting a united front both internally and externally. In turn, this unified approach will help you stay organized and avoid confusion. The best way to do this is to make sure that your office policy is set out in your employee handbook. This needs to be clear, concise, and accessible to all. If someone breaks office policy you need to talk to them and find out why. Don’t start a witch hunt, but instead listen to what they have to say and react appropriately. If they didn’t know or forgot your policy, remind them and make sure that it is up-to-date and everyone else knows what it is. It’s also worth checking your office policy (along with your handbook, procedures, and processes in general) once a month or so to make sure that they are up-to-date. After all, instructions and policies are useless and actively harmful if they are outdated. While it isn’t strictly a job that law office management should be performing, at some point you’ll have to do some legal research yourself. I won’t pretend to know the ins and outs of the law, but I can give you some tips from years of practice researching complex topics to make sure that yours goes smoothly as possible. First up, get your research done as early in the day as possible. Any kind of research requires your full attention, and so trying to tackle it when your head is full of information from previous tasks will only make it less effective or take far longer than needed. The best way to avoid going off on a research tangent is to set yourself a time limit. This will make you inherently more aware of how you spend your time and thus keep you on topic. Having said that, try to get as much research done as possible in one sitting. Splitting your research up will make you lose your train of thought, and when you sit down again you’ll have to waste time reminding yourself. If your deadline passes (and you have no immediately pressing tasks) consider extending it to try and finish your research in one go. Make sure you take short, frequent breaks to avoid burning out. Around five minutes every half hour or so is perfect to let your mind process the information you gathered, but remain in the flow of your work. Finally, consider using dictation software. Once you’ve gathered your sources and read through the information, it’s much easier to tease out your ideas by speaking than writing. Check out our complete guide to dictation software for more information. Screening candidates is a delicate task – you need to make sure that any potential employee has the necessary requirements, experience, and attitude to succeed in your business while balancing them with your company culture. Sometimes the most qualified candidate isn’t the best option, as much of what determines their long-term success is how they get on with the rest of your team and your clients. Hiring without paying attention to cultural fit is a one-way ticket to a high employee turnover rate. However, above all else, you need to be realistic with the time you spend. A single position could receive hundreds of applications (depending on the size of your company and location you’re hiring from) so you need to deal with them as efficiently as possible and eliminate the obvious bad fits quickly. We have a free human resources pre-employment screening process (seen below) to get you started, but it’s best to use this as a template which you can then edit to your own company’s needs. As with your prescreening, it’s vital that you have a consistent new employee onboarding process to get your hire up to speed. They need to be taken through the benefits of the job, given your employee handbook, guided through a summary of their various tasks, assigned a mentor, taken through your safety procedures, and so on. As I previously mentioned, you also need to be including them in your company culture to make sure they hit the ground running. This is partially the duty of their mentor, but it’s worth reaching out to the rest of their team and encouraging them to introduce themselves and have a chat. If you have documented workflows and processes then it should be easy for them to get started with work, but by introducing them to their team and showing who is responsible for what, they can become part of the unit. They will be able to communicate and collaborate if needed, and know who to reach out to if they are unsure or make a mistake. Once again, we have a general employee onboarding process for precisely this purpose, but feel free to edit it as required. Delegating work correctly is a vital skill for any senior figure in a company, be they in law office management or senior development. By delegating work to your paralegals you can make sure that more experienced staff can spend their time on work befitting of their pay grade. Hell, delegation is even part of the definition of a paralegal. Think of it this way; simple tasks usually cost you whatever the wage of your senior employee is times by the time they take to complete. Delegation instead means that you only spend the hourly wage of your paralegal or legal assistant, which will be significantly less. In turn, this means that you can charge your clients less (since the time on the job was partially paralegal work) while still earning more money (since your senior staff can focus on more valuable tasks). If you’re not sure on what to delegate, Norman Clark and Alan Olson published a useful paper called The Art of Delegating Legal Work which covers the basics, including the handy delegation matrix shown below. Running effective meetings is also vital to maintaining a consistent and productive team. If employees are working remotely it’s also a great opportunity to interact with the rest of their team and fill in the communication gap that remote work often creates. The frequency of your meetings will vary depending on the size of your team, the complexity of your work, and how awkward it is to meet up in general. However, from personal experience, I’d recommend meeting at least twice a week to go over important tasks and let your team review your progress. No matter how often you meet, one of the best ways to make sure that your meeting covers everything it needs to and doesn’t take too long is to set an agenda in advance. This should cover all of your core talking points, as well as taking into account any projects that your employees need to report on. While you’re planning out your meeting (however roughly) you should also take a minute to predicts areas that might cause contention. If you know that a particular topic is controversial (or that two employees will not see eye to eye) try to think of a way to keep the conversation civil while not getting bogged down too much in the issue. Speaking of which, setting a time limit is a great way to make sure that you never stray too far from what’s relevant. If you have a set number of points and topics to work through before a particular time, you’re far more likely to cover everything you need to review. In terms of the review itself, you should be keeping an eye on everybody’s deadlines and making sure everyone knows who is responsible for what and by what time. Even if they have nothing to do with the work, this increases the accountability of the employee and will help them to stay focused. Finally, make sure that you don’t waste anybody’s time. If somebody isn’t relevant to the meeting, don’t invite them. Performance management is just as vital to your team as onboarding or screening candidates. A good system will guide your employees to success, reward them for their achievements, support them in their failures, and provide the resources necessary to overcome obstacles. As such, you need to have a system in place for monitoring your employees’ performance. You need to know how they are doing in their current tasks and whether they are meeting their targets. The best way to do this is by documenting your processes and having your employees follow them every time they need to perform a task. This means that they will have a set of instructions to follow for everything they do (making the results much more consistent) while also creating a way for you to track their progress. I won’t go into too much detail here, but check out our free business process management guide for more information. In any case, if your employees are struggling you need to arrange a meeting with them to find out why. If there is a barrier in their way, discuss how to remove it, and if they need extra training be sure to at least talk to them about getting it. Essentially, know when they’re doing well and when they aren’t, reward them for successes, know their goals and what they want to aim for, and support them during failures and/or difficult times. Although I’m sure you don’t need me to tell you this, having a good client onboarding process is vital for maintaining a healthy relationship with your clients and encouraging both return business and referrals. On the flipside, client onboarding sets realistic expectations on both sides. It helps alert you to problematic clients early on, and helps to make sure that false impressions aren’t being set for you to later fail to meet. As with many other elements of law office management, having a set process for client onboarding will help you a great deal in maintaining consistently high quality in your work. Not only that, but a thorough and consistent onboarding process can save you a huge amount of hassle by avoiding malpractice lawsuits down the line. We have a client onboarding for criminal law firms checklist, but as always, feel free to edit it for your own needs. Although I’ve mostly covered the specifics of handling client information (eg, using a cloud storage service that’s suitable for lawyers), you need to have set policies and procedures for doing this. That way you can make sure that your employees conduct themselves in the same way and adhere to your security standards. For example, having a naming convention will allow you to easily access documents when you need them. Above all else, you need to make sure that your clients’ information is secure. If anything happens relating to their security then you’re responsible, so going above and beyond the minimum requirements of your ethical obligations and common law duties is vital. Paying special attention to how meetings are scheduled might seem unimportant, but making the extra effort to go beyond a pen-and-paper calendar is a great way to both save time and make a lasting impression on your clients. 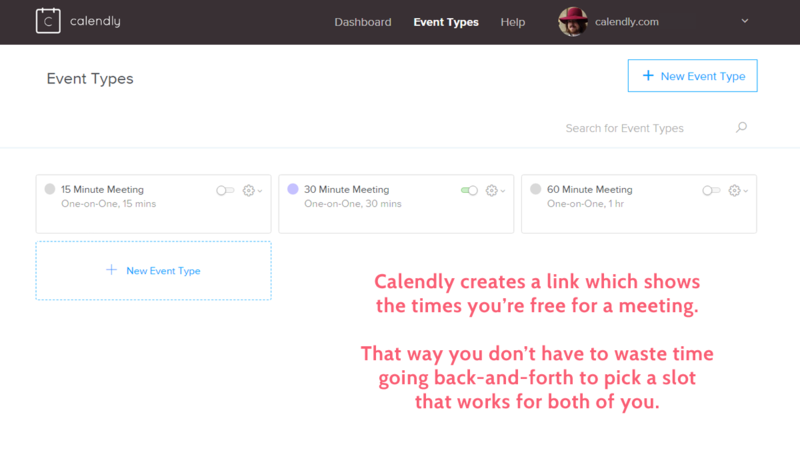 Calendly is a fantastic service which syncs up with your calendar to detect when you’re busy. It then generates a link which you can send to whoever you want to arrange a meeting with, and allows them to choose a time that works for both of you. It completely cuts out the need to have a complicated email chain just to set up a meeting. In terms of organizing your own calendar, default apps like Siri and Cortana let you quickly arrange meetings using only your voice. Services like x.ai are also a massive help, as they provide virtual assistants who your clients can chat to and arrange meetings in a more natural manner. While I’ve already mentioned how beneficial using a cloud storage service can be for law office management, there are risks associated with doing so. Although these don’t need to be assessed often (they’re more important when initially deciding whether to use in-house or cloud storage), it’s vital to review them every couple of months to prevent your own legal vulnerability. First, you need to check the terms of service of your cloud storage platform to make sure that any information you store is not being shared with (or is accessible to) other sites and sources. While you’re investigating this it’s also worth checking the platform’s physical security measures (eg, keycard access) and their disaster recovery plans. Second, their security details should be reviewed to make sure that both you and your clients’ data meets the necessary security standards and fulfills any legal or ethical obligations you have. Ideally, the security should be far beyond the bare minimum requirement. Finally, your cloud storage platform is only as good as the processes and procedures of those who use it. If your employees aren’t following up-to-date methods for storing data, keeping it organized, and setting up their accounts then the cloud’s security won’t matter – your clients’ data will be vulnerable directly because of your team. Create security procedures to follow and make sure that they are part of your documented processes where appropriate. For example, when onboarding your employees make sure that they create accounts with secure passwords, new client profiles need their information to be stored in the right location, and so on. Although the specifics will depend on your location, there are standards which you need to meet in general concerning both you and your clients’ data. In general, as a manager you need to check that the law office’s security program is adequate and that the team is adhering to it. Beyond that, you’ll need to do some digging to find out everything from the regulations of the state you’re in, along with what are considered to be “reasonable measures” to take to secure your data. Also, it’s worth noting that no matter what the minimum “reasonable measures” are, it’s in your best interests to go above and beyond with your security. With the ever-changing nature of the field (and potential vulnerabilities) you should also periodically review your security and have a set emergency plan for the time when that system fails. While law office management can be a minefield of keeping client data secure while performing a more traditional managerial role, as long as you keep your processes and policies updated and make sure that they’re being carried out, you should have nothing to fear. Remember; the key to success is consistency. It doesn’t matter how well your team is performing right now if next week (or month) their practices lapse. Check your security, tighten your best practices, and have systems in place to make sure that your successes are repeated and your failures avoided in future. 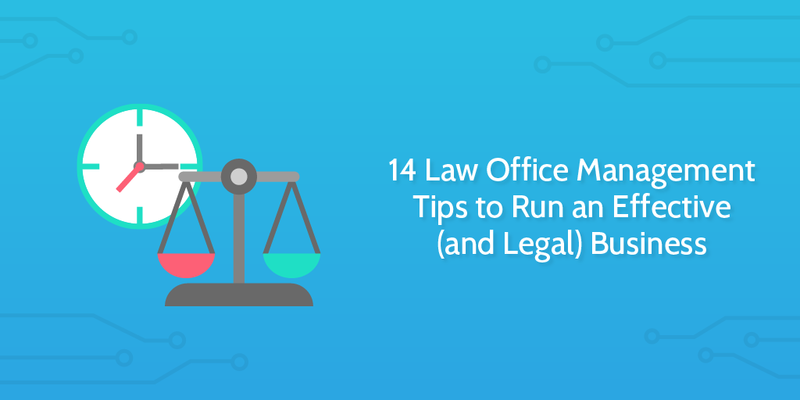 Do you have any law office management tips of your own? Let me know in the comments below! I am a member of the Association of Legal Administrators and serve as an extended Board Member on the Communications Committee for the Orange County Chapter. I came across your article and thought it would be helpful to our members. I am asking for permission to reprint the article in our upcoming Chapter newsletter, WAVES. Please let me know if we have permission to reprint the article. Thank you.